Uzbekistan is conveniently situated between the great Asian rivers - the Amudarya and Syrdarya. Being compared to European countries, the territory of Uzbekistan is not at all small: it is bigger than that of Italy and approximates the area covered by Spain. The nature of the country represents an amazing variety of landscapes: the coastline of the Aral Sea gives place to the Kyzylkum Desert, the subtropical Surkhandarya oasis is bordered by the Pamirs mountain ridges, the fertile Fergana Valley is shut off by the Tien Shan foothills. After having declared its independence in 1991, Uzbekistan became a full member of the world community. The country is a member of the United Nations and has diplomatic representatives in more than 100 countries. We witness a dynamic economic development in Uzbekistan. Thus there has been built UzDAEWOO car-making factory in Fergana Valley. The Chkalov Aircraft Factory in Tashkent manufactures medium-range passenger planes IL-114-100 and transport planes IL-76 (the latter are exported to 20 countries of the world). Uzbekistan is one of the world's leaders in gold mining. The country also has highly-developed non-ferrous metallurgy and chemical industries, and is one of the biggest producers of cotton in the world. Extensive cooperation with international partners, favourable conditions for attraction of foreign investments, participation in international scientific and technological programs are among the most important components of the Uzbek economy. Uzbekistan is the land of a historically eventful ancient civilization, whose significance is in no respects inferior to classical Mesopotamia. The archeological layer of Bukhara, which has been developing at the same site for 25 centuries, is 20 meters deep. This equals the depth of the excavations carried out by Heinrich Schliemann at the site of the legendary Troy. For centuries the land of the present-day Uzbekistan was the junction and the centre of an ancient caravan road which stretched from the Mediterranean Sea to the Pacific Ocean and which was called the Great Silk Road. Towns and countries emerged and collapsed along the road, but for centuries the road went on functioning as a trade and cultural bridge between the East and the West. More than four thousand ancient monuments are known to be located in the towns along the Great Silk Road. Samarkand, Bukhara, Khiva, and Shakhrisabz, the home-town of great Temur, are found fabulous by tourists and have been recognized by UNESCO as historical and architectural monuments of world importance. Today modern airliners, such as Boeings and Airbuses, carry tourists from all over the world to the international airports of Tashkent, Samarkand, Bukhara, Urgench and Termez. Uzbekistan is a developed aviation power. The national airline Uzbekistan Airways has introduced regular flights to most countries in Western Europe, to the USA, Japan, to a number of countries in South-East Asia. The airline has its representative offices in 38 countries. The routes of Uzbekistan Airways are among the most comfortable and efficient air routes in Central Asia. Tashkent, the capital of Uzbekistan and the ancient city whose history exceeds 2000 years, has the population of more than two million people. And the first thing which attracts the attention of the guests of the city is an abundance of newly-erected buildings. Tashkent is noted for a rather intensive and large-scale building-up activity; this construction boom is a real manifestation of the country's economic upsurge. The outlines of the Central and National Banks, International Business Center, a number of modern hotels such as InterContinental, Radisson SAS, Le Meridien, Dedeman, and many other buildings make Tashkent look a modern metropolis and they perfectly blend into its panorama. There is much in Tashkent for the guests of the city to see and enjoy. 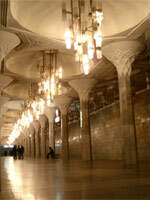 Tashkent Underground, the only underground in Central Asia, is one of the most beautiful in the world. The glassy surface of Aqua Park pond, the courses of the golf club are irresistibly attractive during long summer days. Today the Tashkent Golf Club on the Lakes is getting more and more popular with both the residents and the guests of the city. The latter often go sightseeing after visiting the club. Tourists are also welcomed to the museums of Tashkent. Among them there is State Museum of Fine Arts with its unique collection of exhibits, Museum of Applied Arts of Uzbekistan, Amir Temur Museum, devoted to the dynasty of the Temurids. Ten Tashkent theaters open their doors in the evenings. One of the theatres is the Alisher Navoiy Theatre of Opera and Ballet, which was designed by the academician Tchusev. The theatre's repertoire includes operas and ballets by Verdi, Bize, Tchaikovsky, as well as by modern Uzbek composers. In the restaurants and night clubs one can taste the delicious dishes of the Uzbek national cuisine, listen to music and watch fascinating shows. It is also possible to enjoy the unforgettable panorama of the night city with its star-like lights beneath from the viewing platform of Koinot restaurant accommodated inside Tashkent TV tower at the height of 100 meters. So it is not without reason that today Tashkent is often called the Star of the Orient. In eighty kilometers from Tashkent there rise the snowy peaks of the Tien Shan mountain spurs. Here Ugam-Chatkal national park is situated at the junction of three mountain rivers. Rich in flora and fauna, the park attracts tourists from all over the world. In the picturesque valley just at the foot of the Great and Small Chimgan mountains there was built a resort and recreation complex called Chimgan Oromgohi. Its comfortable cottages and hotels with bars and restaurants welcome guests all the year round. In warm season the resort becomes a centre of mountain hiking. A wide variety of hiking routes have been laid here: from easy ones, which any healthy person can travel along, to hard-to-make ones with ascents to steep slopes and crossings of mountain rivers. The horseback riding tours should be especially noted. The romance of horseback riding tourism attracts to this reserved area all those who are fond of this activity. In winter the resort becomes very popular with mountain-skiers. The excellent winter recreation activities are ensured here by a relatively mild climate with almost no wind and 300 sunny days a year, by a wide choice of ski-tracks for slalom and downhill speed skiing, which are equipped according to the international standards. Modern Uzbekistan is a young secular state, which is now on the pathway to its renaissance. And one of the vivid evidences of the country's new realities is the revival of the Great Silk Road. However, it is not a recurrence to what the road used to be in the past. Time has changed and speeds have changed too. While in the past a long journey on camels could last a year or longer, today the same distances can be covered by plane in 2-3 hours. The essence of the Silk Road has remained the same though: the road still serves as an international convenient through highway for transportation of people and goods, as a channel which helps peoples and countries get to know each other better.